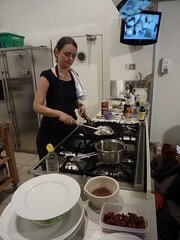 Here is Fuchsia Dunlop frying some pork belly slices in a wok at a cooking class in London, for ‘twice cooked pork’. Her class, “Sincerely Sichuan” at the Divertimenti cookery school, was completely sold out. Sitting in the front row (and in the back rows too!) one could smell the lovely fragrance of Sichuan pepper being ground to a fine powder (to be sprinkled on Mapo tofu later on). Fuchsia handed out a small bowl of this Sichuan pepper so everyone could have a taste. They were (or it was, because I had only one!) was the most powerful huajiao I have ever had. Although Fuchsia warned everyone just to bite on it gently for 3 times and then spit it out, most of the participants started coughing and scraping their throats for at least 5 minutes. Even after getting a huge glass of water, my mouth felt this tingling numbing effect for a long time! Fuchsia did all the Sichuan classics in her cooking class which lasted over more than two hours: spicy cucumber salad – fried in a wok; fish-fragrant aubergines; twice cooked pork, Mapo tofu and Gongbao chicken. She not only did all the cutting and stir-frying, but was talking all the time about Chinese culinary traditions, her travels in China, and her experiences in becoming a Chinese chef. Seeing an expert at work (and she is!) really makes a lot of difference. Dunlop is great in explaining the different styles of flavors (using Chinese culinary terms as well), and can show it by bringing out a different combination in every dish. It is not just chiles and spices, but a careful mixing of ingredients to get a totally different end result. For those who think Chinese cooking is only about stir frying at the highest fire possible: it is not. Fuchsia Dunlop takes her time and sniffs the wok regularly to see if the flavor is there yet. Her Gongbao chicken was truly great – it had the stickyness of the sauce all around the ingredients- and her twice cooked pork incredibly awesome – I’d order every dish in a restaurant if I had the chance. And perhaps I will -after today’s lunch at the Baozi Inn I’m planning a meal at Bar Shu tomorrow, the restaurant where Fuchsia Dunlop devised the menu and acts as consultant. When I go home, I’ll have enough Sichuan flavors to keep me going for a while!